With thanks to Staedtler staff in Canada, Germany, and Thailand, there is further news on the EE grade pencil. After the EB and EE grades were withdrawn, Staedtler Malaysia continued making those versions for their market, with graphite cores supplied from Germany. This production ended in 2005. 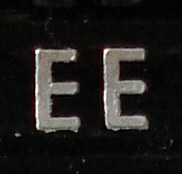 At present, some of the 8B pencils made in Germany are stamped EE for the Asian market. Staedtler still makes the EE grade pencil! The photos show a box of the former EE from Staedtler Malaysia. Using pencils for writing, note taking, flowcharts, and diagrams, I’ve rarely explored their softest grades, those beyond 4B. Though pencil making details are trade secrets, it is known that graphite and clay are the main ingredients in a pencil’s lead. There are also waxes and binding agents in pencils. At least one pencil has used rendered bovine fat! The ratio of the graphite and clay is what determines the pencil’s darkness and softness, with more graphite meaning darker and softer. I thought I’d take a look at the softer Staedtler Mars Lumograph 100 pencils, specifically the 5B, 6B, 7B, and 8B. The first observation is that the pencil cores get progressively larger. I’m not sure where in the line this starts (possibly 3B or 4B), but the 8B has a core of about 4mm in diameter, double that of a regular pencil core. This does result in heavier pencils, and a scale confirms this. The second observation is also about the lead’s appearance. As well as being black, graphite has a shiny luminescence. 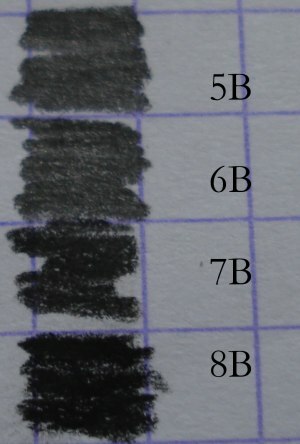 And the 5B and 6B are indeed very shiny – but the 7B and 8B have only a slight shine, and border on being matte. For writing and drawing, my expectation was that pencils get progressively softer in this range, with the softness and sharpening requirements being the tradeoff required for the rich lines drawn. This expectation was wrong – the pencils reach maximum softness at 6B, with 7B and 8B being much scratchier. The finish of the lines is consistent with the appearance of the pencils – the 5B and 6B lay down shiny lines, while the 7B and 8B leave matte lines. 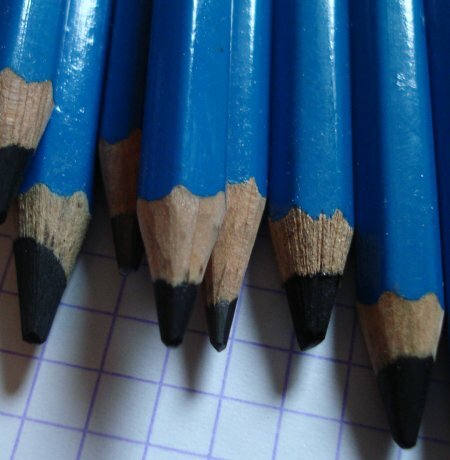 One expectation is correct – each pencil grade increment does create a darker line. My conclusion is that the Staedtler 7B and 8B pencils have significantly different formulations – and not just incremental variations in their graphite-to-clay ratios.